Fonochat is the largest latin chatline in the US and Canada. FonoChat is the largest latin chatline in the US and Canada. It is intended for singles who would like to meet hot Latinos (both guys and girls) in their area. It is designed in such manner as to be easily accessible for everyone, although the service is clearly intended for individuals of or the above the age of 18. Although FonoChat was originally provided solely in Spanish, it is now available in English as well. FonoChat is a latin chatline that connects individuals directly to one another based on initial preferences set. It also offers the possibility to record user messages including greeting messages and any other which may be useful in the process of finding a partner. The service is available for multiple countries thus offering singles the ability to easily meet other members in their area and connect to them live. The service is available for multiple countries and is created as to enable everyone to use it comfortably regardless of the time of the day or phone used. Entire interface is easy to use, customers being guided throughout the service first time they call which greatly facilitates overall usage. Likewise, it is available through both mobile and landline which is highly convenient for individuals who prefer a certain type of device. FonoChat does come with additional features such as HotList, messaging and mailbox, which aid members into expanding their reach. The service is able to track connections made and new friends or contacts as to allow individuals to easily access them at a later date. FonoChat charges its customers with different rates based on the subscription package chosen. Thus, 10 minutes can be purchased for just $4.99, 60 minutes for $9.99 and 120 minutes for $29.99. Extra minutes can be purchased later on based on the subscription package chosen. Offers Free Trial? Yes, FonoChat does offer a free trial for users based in U.S. Clients will have to call a phone number (toll-free) in order to see which offer they qualify for. 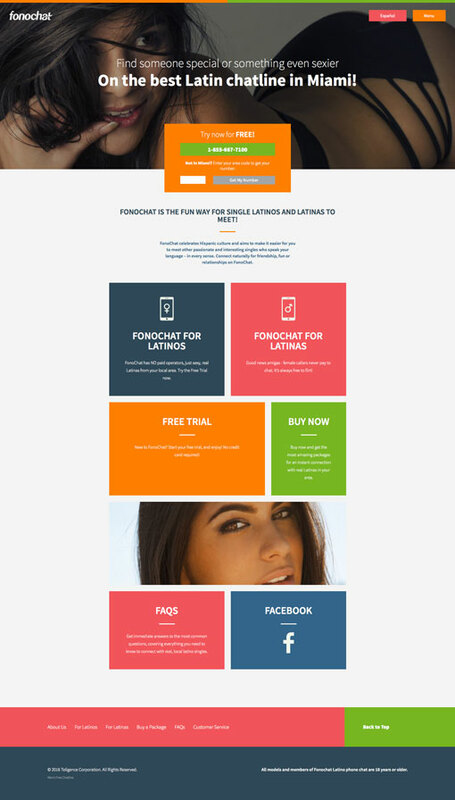 Paid Membership Perks: Members of FonoChat receive access to a private mailbox, messaging feature as well as access to HotList which enables them to meet hot latinos in their area. Availability: FonoChat is available for most of the U.S. regions and Canada, although a top city is not exactly decided. Score: 5 stars. FonoChat offers plenty of features to its users, is a well-established service and it also offers a completely free trial.